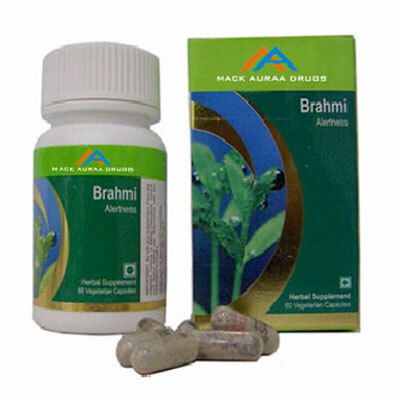 Brahmi is an Ayurvedic herbal supplement traditionally used to support alertness and concentration. It is a small, creeping herb that grows in damp, marshy areas. It is reputed herb in India where it is cultivated for medicinal purposes. In previous centuries, people didnâ€™t worry so much about age- related brain conditions. Forgetfulness, speech problems and confusion were simply considered part of getting old. Now that our bodies are remaining fit and strong for much longer, itâ€™s increasingly important that our minds also remain active â€“ as much for our families sake as our own. Caring for a person suffering the effects of degenerative brain disease can be extremely draining both physically and emotionally. The brain is the centre of our nervous system and the most metabolically active organ in the body. It is made up of some 100 billion neurons and weighs about 1.3 kilograms. The brain utilizes about 20% of the total oxygen used by the body, so a good blood supply to brain is crucial. Under normal circumstances, the brain uses a continuous supply of glucose as its source of energy. Without constant replenishment, the glucose reserves of the brain will be used in approximately ten minutes.